Yesterday, I cut and sewed the rail fence blocks and placed them on the design wall so I could see the quilt come to life. The Banyan Classics fabrics make a very striking quilt, don’t you think? I just love the color palette! Whether you finish your quilt yourself on your domestic sewing machine or have it professionally quilted on a longarm quilting machine, you have many options for the quilting design which will hold the three layers of the quilt sandwich together. Here is my design thought process. As well, since I wanted to showcase the gorgeous Banyan Classics fabrics, I chose a big, open design; something not too intricate or dense to steal the spotlight. The focus was on the fabric, not the quilting. I also wanted to keep the feel of the quilt more masculine, so I avoided anything too flowery or dainty. To me, the prints and color palette have a modern feel to them, so I kept the quilting design simple; more graphic, less busy. Big, curvy quilting design complements the rigid geometry of the piecing. Lastly, I personally like quilts with very little quilting on it; they just feel more-cuddly to me. 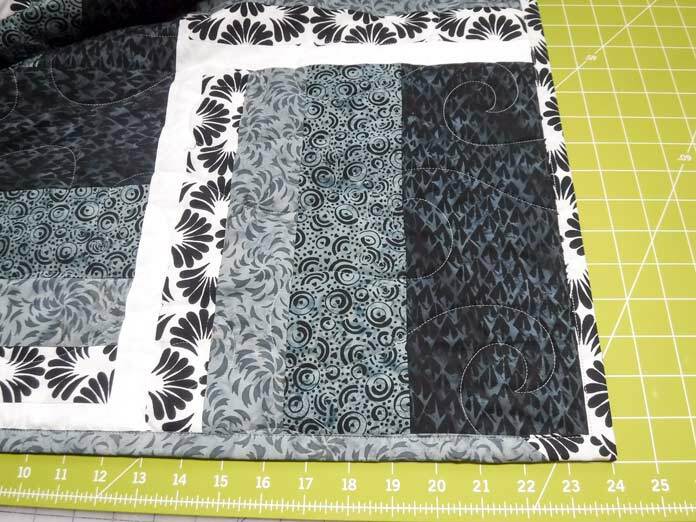 I know, that sounds weird given I have a longarm quilting business and quilt for a living, but the type of quilting I do for my clients isn’t always the type of quilting I do for myself. It depends. Ultimately, it’s your quilt, so you quilt it, or have it quilted however you like. The same goes for thread color. Because of the color palette of the Banyan Classics Collection, you might choose to quilt your quilt with black or white thread. That was my first thought, too, but, after I auditioned each, I thought each a bit too stark; they stuck out too much, for my liking. You may feel differently, and that’s totally okay. Another thought is to add a splash of colorful thread; perhaps a fiery red, my favorite color! Again, I thought that would stand out more than I wanted because, again, my focus was to highlight the fabric, not the quilting. Instead, I choose to use a neutral, soft off-white, 60wt thread, which meant it practically disappeared into the fabric. Perfect! Binding is one of my favorite parts of the quilt-making process because it means I’m in the home stretch; my quilt is almost done and ready to enjoy. 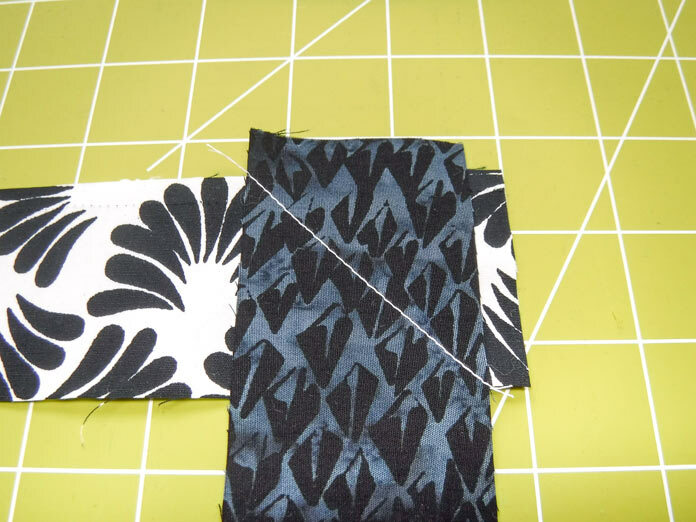 Option 1: cut strips from the leftover fabric you cut off from around your quilt when you square it up, OR Option 2: cut strips from the assortment of fabrics leftover from cutting your strips and piece them together for a scrappy binding. Initially, I had planned to do Option 1 but changed my mind last minute and decided to do Option 2 instead. Isn’t it wonderful? It’s your quilt so YOU have the power to do as you choose. Place strips right sides together and sew a diagonal seam to piece binding together. Trim seam allowance to approximately ¼”, trim off corners. Regardless of which option you choose, your next decision will be HOW to bind your quilt. 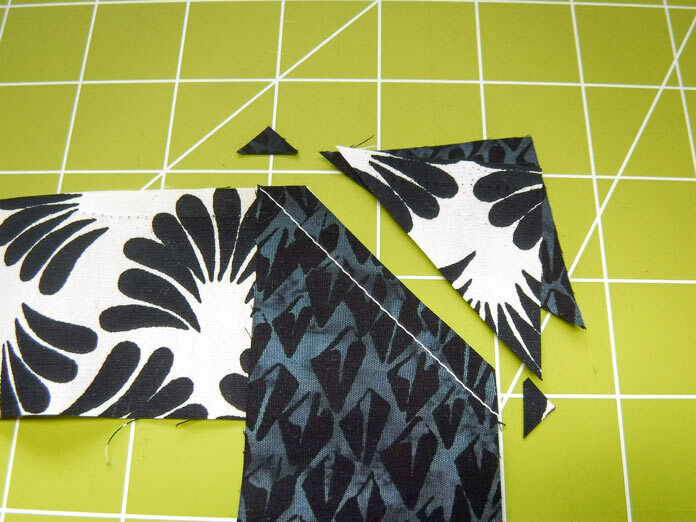 There are loads of good suggestions in Elaine’s article, Binding a quilt, and many YouTube videos on the subject, but, basically, you’ll decide if you’ll finish your binding by hand or machine. I have a very slick, nifty attachment for my brand of the sewing machine which allows me to finish my bindings very quickly in one step, so ask your brand’s dealer what they may have available to help make the process quicker and easier. In my case, I cut my strips 2″ wide, but typical binding is usually 2¼” to 2½” wide. However, some quilters prefer to cut their binding strips 3″ wide, so again, the choice is yours. Binding a quilt is quick and easy when done by machine. There’s nothing better on a cool fall evening, or, when you’re stuck on the sofa sick with the flu than snuggling up with a quilt you made yourself or by someone who loves you. Done! Now, wasn’t that easy!? 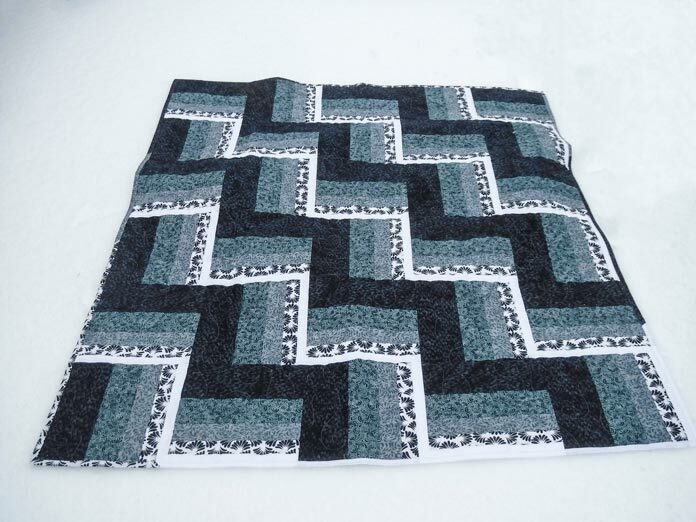 Enjoy your beautiful rail fence quilt. It’ll surely become a classic in your collection, especially when using the beautiful NEW Banyan Batiks Banyan Classics Collection. While studying Fashion Design in college, Michael’s life and career ambitions took a dramatic turn when he caught the quilting bug in 1991 after watching Eleanor Burns from Quilt In A Day on PBS. 28 years, and hundreds of quilts later, he continues his love of quilting as a professional longarm quilter, sought-after speaker, teacher, Janome Educator, Dealer and Certified Service Technician for APQS longarm quilting machines, and now, QUILTsocial blogger! In 2017 Michael’s quilting journey came full circle when he finally met his mentor, Eleanor Burns and is now a Certified Quilt In A Day Instructor, as well. As Michael says, “So much creativity; so many quilts, sew little time!”. This is a great rail fence! It almost looks like shadows or frames. I really love the look. And great choice to use the leftover fabric for the binding. It really adds to the design. I will keep this in mind when I need to make a quick gift. It really is beautiful in these colors. Thank you “sew” much, Leslie! I’m glad you liked the quilt. The Banyan Classics collection really is quite beautiful, isn’t it. I loved making the quilt and want to sew another one, especially with the weather so nasty outside today. Stay warm! 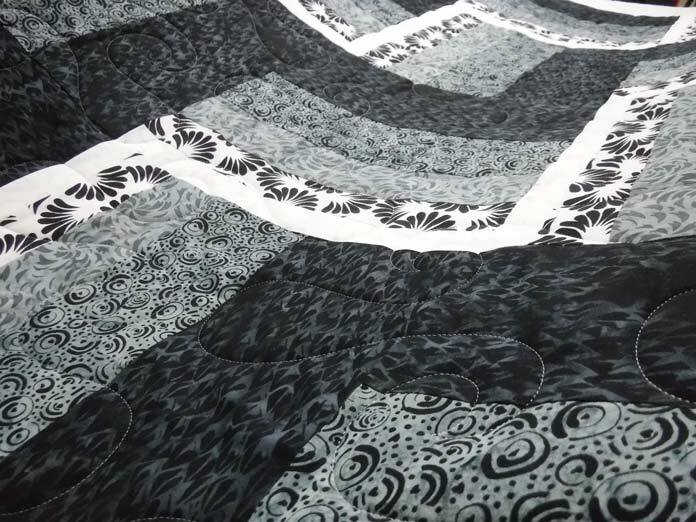 I love the white and white and black with this fabric, just makes the quilt! Thanks for your feedback, Rhona. Yes, aren’t these Banyan Classics fabrics beautiful!? So striking! I love this. Okie combination.